Trail blazing is the ancient practice of marking paths with a system of symbols to help travelers navigate, and since the rise of recreational hiking in the 1800s, has been adapted to foot trails. Blazes are generally placed at eye-level, and spaced frequently enough to reassure hikers of the route. 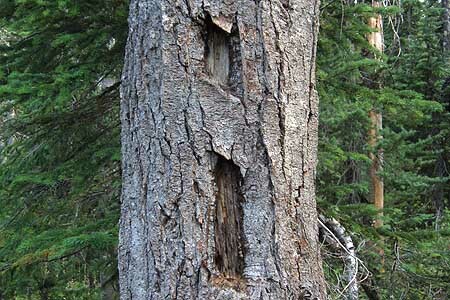 In the Pacific Northwest, where most of our hiking is on public lands, we are used to the standard Forest Service tree blazes that still mark most of our trails (like the one pictured at the top of this article). 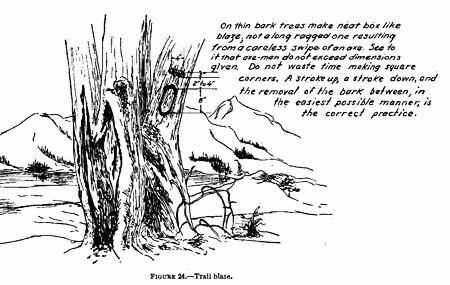 Though the practice of chopping blazes into trees has long been discontinued out of consideration for trees and trail aesthetics, many of the original blazes still remain, decades later. 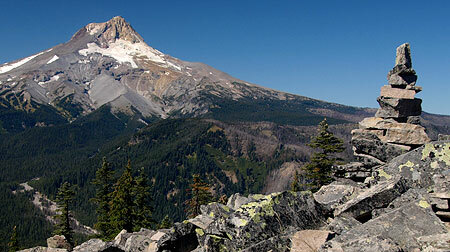 Where trails leave the forest canopy, many Northwest trails are marked with stone cairns, such as along Gunsight Ridge (above) near Mount Hood. Along Mount Hood’s famous Timberline trail, cairns along the high eastern section are further accented by 6x6x8 cedar posts (below) that have been gracefully carved by the elements over the years. Today, the legacy of Pacific Northwest trail blazing is fading quickly, as most blazes were made at least 50 years ago, and some as much as a century ago. 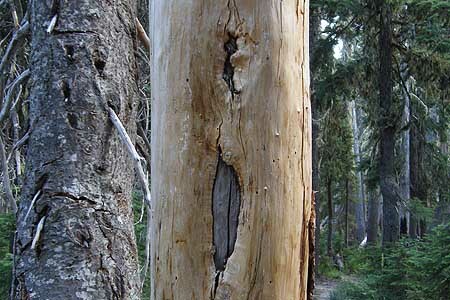 The example below, on Mount Hood, is from a standing snag that tells a familiar story: the tree survived the initial blaze marks for many years — long enough to heal — before finally dying and losing its bark, revealing the layers of blaze-scarred wood, beneath. 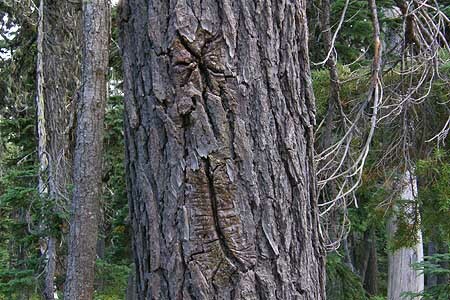 Most northwest trees large enough to withstand a blaze are very large, long-lived species, so there are also countless examples of blazes that have simply been swallowed up by successive seasons of growth. With a sharp eye, you can often spot examples like the one below, where only the healed-over scar of the blaze remains. This tree has nearly erased the blaze scars that were likely made in the 1930s or 40s, but could easily thrive and grow for another century or more. By the 1930s, the Forest Service had established a simple standard for blazes that is responsible for the thousands of blaze remnants that we see today. The Forest Service blaze consisted of an 8” rectangle topped by a 2” rectangle, forming the familiar upside-down exclamation mark that we still find on our trails. The width of the rectangles was determined by the width of an axe blade, roughly 4” across. 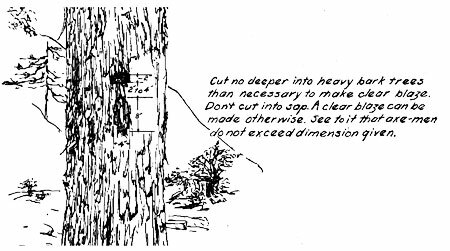 The following instructional diagram is from a Forest Service trail manual dating to the 1930s, and provided the basics for the thousands of young Civilian Conservation Corps (CCC) workers who flooded the nation’s forests and parks during the Depression, building trails, campgrounds and roads. As the diagram (above) shows, the Forest Service blaze was designed for speed, with trail crews quickly working their way along paths, blazing as they went. The crews of the 1930s covered thousands of miles of trails, as the trail network of the day was more than twice what survives today. Though most of our trail blazes in the Pacific Northwest follow this standard (or use cairns in open areas), one notable exception exists that is closer to the Eastern system of customized trail icons: the Pacific Crest Trail (PCT). 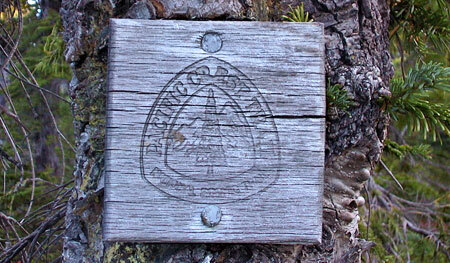 Throughout its length, the trail is marked with the familiar triangular shield (below), though the old-style metal PCT signs still survive in many sections of the trail. The PCT sign is an accepted Forest Service standard, and it makes sense that an iconic sign is warranted, as most of the PCT is stitched together from the cobweb of forest trails that existed prior to the PCT, making for many potentially confusing junctions along the way. Clark’s whimsical icon signs also appeared at Devils Rest and Trapper Creek, as well as other spots in the Gorge, and a few still remain today, providing a charming, rustic feel that is unique to these spots. Click here for an early 1980s Oregonian tribute to Clark. A Future for Themed Blazes? Chopping blazes into living trees is now a relic of the past, but is there a future for more contemporary blazes along our forest trails? After all, we have only a few decades left before all traces of this earlier era are erased, and trails will be completely reliant on other forms of signage and markings. One route that could benefit from an iconic, tailored blaze sign is the Timberline Trail. The system of cairns built in the most alpine sections are a good start, but along the rest of the route, there are many spots where the web of intersecting approach routes make it confusing to know if you are still on the loop trail. 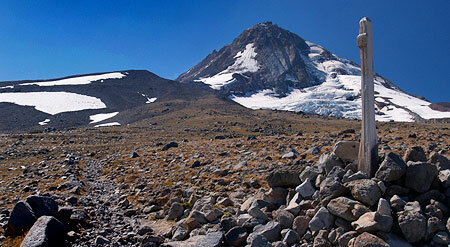 The Timberline Trail has a couple of easy options for a blaze theme — the Timberline Lodge logo (below, left) or perhaps a CCC-based logo (below, right), given the unique history of the trail. Other candidates could be the simple loop paths that circle Lost Lake and Trillium Lake, two of Mount Hood’s most visited destinations. Both have thousands of newbie hikers visiting them in the course of a year, many hiking for the very first time. Both trails also have a maze of unofficial, unmarked fisherman and campground paths that can make staying on the loop trail confusing, so a system of blaze signs would provide a useful function. How might this come about? As Basil Clark proved, themed blazes are a perfect project for volunteers, from designing and creating the signs, to providing the ongoing installation and maintenance inherent to trail signage. Perhaps trail organizations like Trailkeepers of Oregon, the Mazamas or the Trails Club of Oregon would jump at the opportunity to provide this service? As always, one way you can help is to propose this idea (or any others you might have) to the Forest Service through their online suggestion box.